When a new position opens in an office or factory, the company frequently has to look outside its own four walls for help. Posting on job boards and sifting through resumes trying to find the perfect fit is a difficult job. That’s why, in some cases, companies immediately look for referrals from employees. Not only are you helping out your company, you’re helping your work environment. If you refer a reliable, resourceful worker and they are hired, you are strengthening the company you work for. Also, bringing in someone new on your team gives you more room to grow upwards in your role. Sending your company a good referral will enhance your credibility and reputation. Not only will you be seen as a dedicated employee, you’ll be seen as someone who values the company enough to want to bring more great people to the team. Since referrals aren’t required, this is going above and beyond for your company. Supervisors will notice your dedication and it will be accounted for. Lucky for you, many businesses offer incentives for good referrals. If you refer a high-quality employee and they are hired, you may get a certain amount of money or gift certificate. This mutually beneficial relationship is easy for everyone: a great new employee for the company, a reward for you and employment for your friend. Sending good referrals can help improve your relationships in and out of work. At work, your bosses and peers will be appreciative of your referral. This will help build trust and collaboration. In your personal life, a stronger bond will be formed with whoever you referred. Your friends and family will also admire you for helping others. This time, it’s you giving the referral. Who knows when you may need the favor repaid. If you refer trustworthy acquaintances to jobs they are interested in, when you’re the one looking for a job, you’ll be at the top of their mind. A referral now may help lead you into your next big career move in the future. 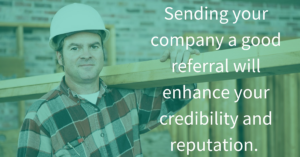 In more ways than one, sending a quality and trustworthy referral to your company can really benefit you. If you hear a referral is needed, learn more about the position and keep an eye on your network for a good fit. If you’re the one in need of a referral this time, contact an Alliance Industrial Solutions recruiter.